I recently managed to get my hands on a copy of the much-praised book Groundswell, by Forrester. It’s a fantastic book which answers any questions someone may have over the value of social media, blogs, forums etc, with some outstanding case studies from companies large and small. To quote a section taken directly from Groundswell,”If you have a brand, you’re under threat. Your customers have always had an idea about what your brand signified, an idea that may vary from the image you’re projecting. Now they’re talking to each other about that idea,“. In short, your brand isn’t just what you want it to be anymore, it’s dictated by people all over the world, speaking to each other and making their own minds up. Whilst I enjoyed pretty much every word of the book, the most interesting section was about Lego, and how it embraced the Groundswell in a positive way. The Lego case study explains how the company energised the existing community to it’s benefit. Lego was a little slow in developing it’s online presence and because of this, a couple of websites / networks had already became established on the Internet, one of these was LUGNET. Rather than aim to replace LUGNET with it’s own official community however, Lego embraced the website and introduced the Lego Ambassador program which helped Lego find brand enthusiasts through the LUGNET network. I came away from the book with a high opinion of the Lego brand and even went and had a look around LUGNET to see what work had been done since Groundswell was written in 2008. Whilst the website didn’t seem to thriving exactly, it looked like Lego still hadn’t launched its own community. Good going from Lego and reinforcing their positive approach to the Groundswell. 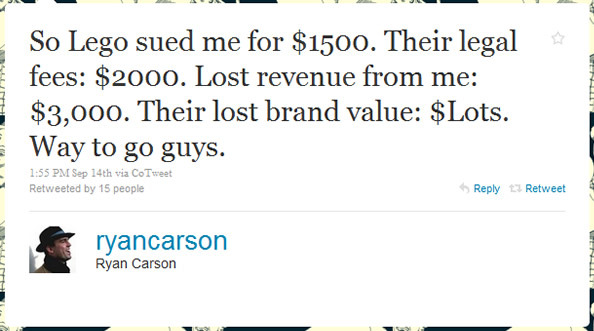 Ryan went on to say that Lego had sued him because had registered the domain name www.legostarwarsfans.com. While we’ve no idea what Ryan intended to use the website for (we presume it wasn’t for a massive monetary gain), it seems a massive step in the wrong direction for Lego. On the face of it, they’ve kept a Lego-related domain in their control and covered their legal costs (and more) in the process. But like Ryan mentions, the impact this could have on their brand value is absolutely massive. Surely Lego don’t want to scare off fans who are interested in starting websites dedicated to one of their favourite hobbies? Having seemingly embraced the Groundswell, and thriving in it, Lego looked to have taken a backwards step in their approach to the Groundswell. Companies can no longer control what people say about them, “right now, your customers are writing about your products on blogs and re-cutting your commercials on YouTube. They’re defining you on Wikipedia and ganging up on you in social networking sites like Facebook. These are all elements of a social phenomenon — the groundswell — that has created a permanent, long-lasting shift in the way the world works“. Some companies are embracing these trends and new technologies in a positive way and reaping the benefits (McDonald’s recently saw a foursquare campaign increase checkins by 33%), whilst other companies are simply sitting it out, waiting for this whole ‘social media thing’ to blow over. In this environment, it’s vital that companies like Lego approach their social media campaigns correctly because as John O’Nolan recently stated, “the difference between companies ‘Getting it’ & ‘Seriously not getting it’ is the very fine line which divides success & failure”.